CHE + 12. Federal Wyo. — The first town on the Colorado & Southern Railroad after the railroad makes a sharp bend to the north. Fly about 6 miles south of Federal and leave the Colorado & Southern tracks about 1 mile north of the pronounced bend. The compass course, when there is no cross wind, is about 310˚. Cross Sherman Hills or Laramie Mountains at about 9,000 feet above sea level. Crossing this range of mountains the Laramie Valley appears where landing fields abound. 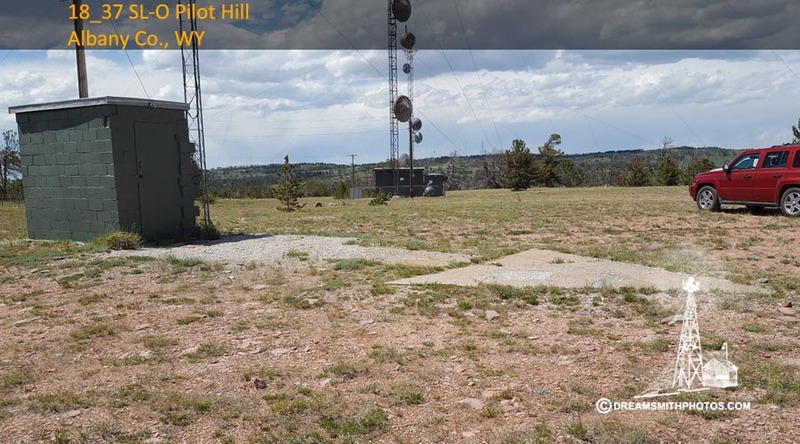 The Pilot Hill beacon site is located at the top of a ridge a couple of miles from Hwy 210, which connects with I-80 at exit #323. 4-wheel drive is not needed to reach this site due to the dirt road being well maintained. Upon arrival at the site we noticed that several people had travel trailers, and were camping. We were unable to fly our drone because of very windy conditions, and two tall communication towers and multiple guide cables. Only three portions of the arrow were visible: the center pad which was in poor condition, and the front shaft & arrow point which were in fair condition. 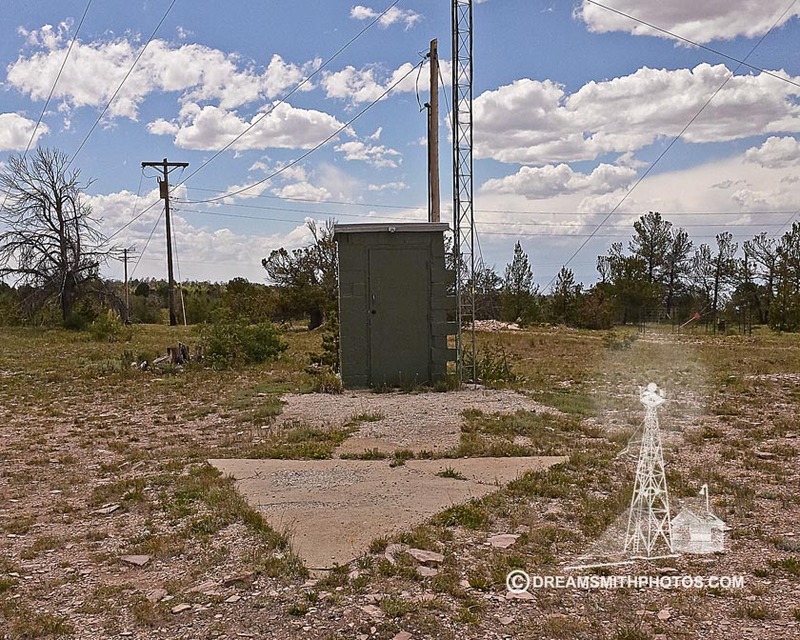 A concrete block house, most likely used for communication equipment sits over the back-end of the arrow. The exposed portion of the arrow was 33 feet in length. The arrow points in an E-SE direction. The pilot would approach on a heading of 98° and exit on a heading of 103°. The photo below was taken in 1924 by the caretaker of the Sherman Hill beacon site, for publicity purposes. Unfortunaltely when the film was developed it revealed that the top of the tower and beacon light were cut off. Nat Dewell, an Omaha photographer, was asked to photograph the beacon light at Wann, Nebraska and to fix the problem of the missing beacon tower top. 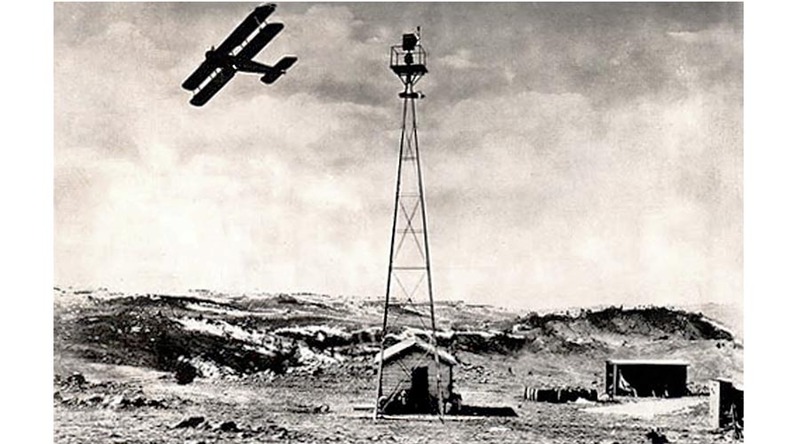 Pilot Slim Lewis flew a bi-plane around the tower while pictures were taken, and back in his studio Nat created the photo below from the photos taken at Sherman Hill, Wyoming and Wann, Nebraska. He created a composite photo showing a complete Sherman Hill beacon with a plane in flight. This photo was used on the cover of Aviation magazine in December 1924, the cover of the U.S. Postal Guide for April 1925, and in an advertisement for Goodyear Aviation Equipment published in the February 1926 Aero Digest. Airway beacon is 36 in. 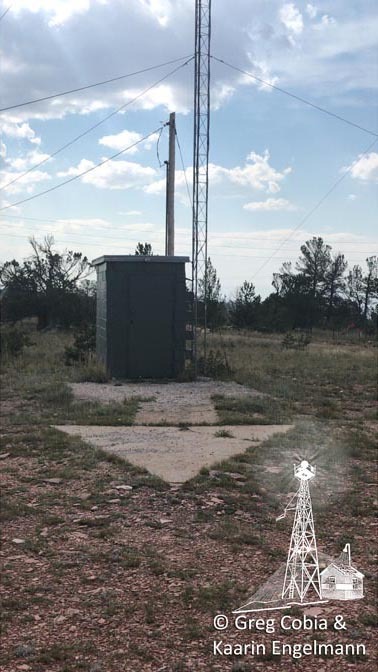 beacon on 51-foot tower, about 10 miles east of Laramie. 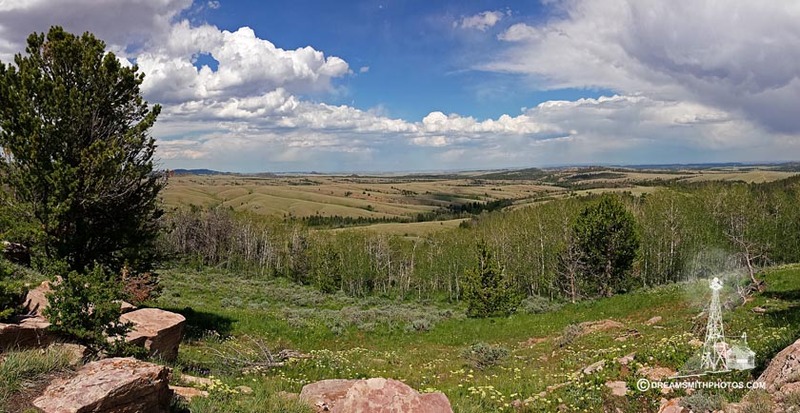 To reach from Laramie, go east approximately 10 miles on LINCOLN Highway to the intersection of Happy Jack Highway with Lincoln Highway, go east about 1/2 mile on Happy Jack Highway, turn left and go approximately 2 miles on trail to site on high ridge of Sherman Hill. Station Mark--top of beacon. Reference marks--none. Station is the standard C.A.A. 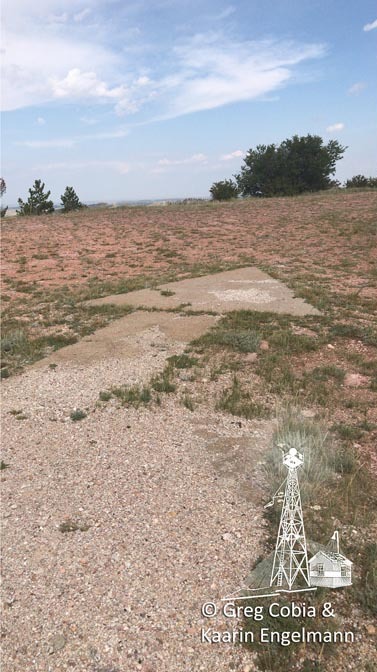 rotating beacon located about 8 miles east of LARAMIE and about 2 miles north of U.S. Highway 30. The beacon is on a structural steel tower about 50 feet high. The center of the top of the beacon was the point observed on. Probably the same station as Salt Lake-Omaha Airway Beacon No. 38, 1933.